First of all, we want to say THANK YOU for taking the time to visit us, and for digging our work! It means the absolute world to us that you love what we do, and are thinking about working with us on your special day! It is truly an honor to be able to share the biggest day of someone's life, right there by their side all day! If you have been looking around our site a bit, and are really interested in working with us, we would love to invite you to reach out, right now! Shoot us an email at info@simplysavvyphoto.com, or give Amanda a call at 812-604-3811! We would love to set up a time for you to come by the studio, so we can hear all about your special day and all of your ideas about your photography! At our initial meeting, we would chat about the details of your day, and get to know each other a bit. We feel that is very import that you gel with our personalities. We will be spending a lot of time together during your planning phase, as well as on your big day, and afterwards, so it's very important that you feel like we are people you would want to hang out with that much! We also want to make sure that our style and the way we work is going to fit what you have in mind for your photographer, too! Once we have established that we are a good fit, we can go over the details on our end. We require a 25% retainer, as well as a signed contract in order to reserve your date. If you decide you love us and want to work with us, we can take care of everything and make it all official on the day or our meeting! Once we make everything official, it'll be time to start planning your engagement and/or boudoir session! All of our collections include a second day session of your choice. This can be engagement, boudoir, bridal, rehearsal coverage, or a day after session. Any of these that must be photographed before the wedding can be scheduled right away! We love being able to spend some extra time with you before the big day, as it just strengthens that bond between us, and makes us be able to capture truly amazing photos on your wedding day!! Your second day session may be held anywhere within a 60 mile radius of our studio, and includes digital images with printing rights, as well as a 20% discount on any additional products you would like, such as albums, prints, and wall art! Taking a trip the day after, but want a day after session? Ask us about travel destinations! We are always happy to travel with you, for an additional fee. We find that it is key to schedule a final meeting, about 4-6 weeks before your wedding, so that we can plan out your timeline for your big day. Going in with a plan is so important, because it allows us to maximize the time that we have, and organize the flow of your photography throughout the day. With great planning comes great images, and we want to give you nothing less than that! We include custom timeline planning for you, as a service at no additional charge! Any final balance on your wedding collection would be due at this meeting, although some of our couples makes payments in between and have the balance paid by this point. We are super flexible and are happy to set up any type of payment plan that works for you! We begin your day by meeting you wherever you are getting ready! Whether you have full getting ready coverage in your package or minimal coverage, we like to document the fine details of your clothing, your hair and makeup process, you getting into your dress, your mother putting your veil on, and all of the other special moments that you will want to cherish forever. Let's not forget all the photos of your groom hanging with his guys and playing cards, or whatever activities they find theirselves into beforehand! Did you two get each other personal gifts or write each other letters? We want to be there to document this exchange, too! Once everyone is all ready to go in their wedding attire, we like to get some of the wedding party photos, family formals, or anything else that doesn't require the two of you to see each other before! Some of our couples do a first look, in order to get those nervous jitters out of the way, or to just have a more intimate moment together. Some of our brides don't want to see their groom, but may have a first look with their dad or their son at this time. Now, it's time for you to walk down the aisle! One of us will be at the front of the aisle to capture the bride walking down with her father, while the other will follow the bride out, so she can capture the groom's expression of seeing her. Once the processional is over, each photographer will take a side, so that we can focus on both bride and groom during the ceremony. We also like to capture your family and guest's expressions throughout! After the ceremony, we will capture your remaining family formals, and then finish up the wedding party. We like to end this time with an intimate session of just the couple, so that they have time to connect with just each other before going in to the reception. 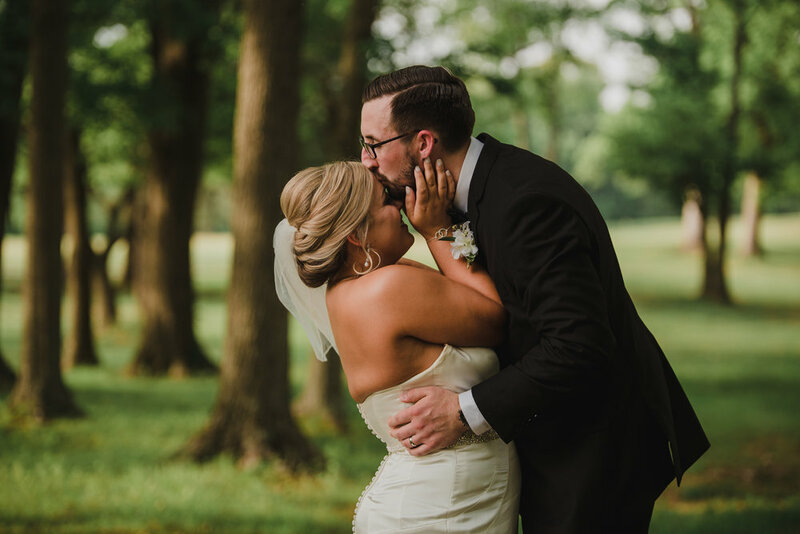 We typically schedule about an hour to hour and a half between the ceremony and reception, so that we have plenty of time to capture all of the photos that you would like. At the reception, we will capture things like the introduction of your wedding party, your cake cutting, your first dance together, as well as your dances with your parents, and of course the bouquet and garter tosses, and the toasts from your best man and maid of honor! Many of our couples choose to go back out after the events for another intimate photo session. This allows for sunset or night time portraits, which is a great finishing touch to your day! See your photos when you return from your honeymoon! We pride ourselves on having a fast turnaround time! We typically have your photos finished around the time you are returning from your honeymoon! In most cases, your images are finished within just 2 weeks! Once the images are ready, we will send your online gallery to you, along with instructions for choosing your album images! Once you have chosen those images, we can begin the design work! After all products have been designed and ordered, we can ship them straight to you, or have them sent to our studio for easy pick up--whatever works best for you! You can expect your products within 3-4 weeks from the time of order, in most cases. Feel free to reach out to us at info@simplysavvyphoto.com, or by phone at 812-604-3811!